Batavia, NY – As the weather gets colder, she keeps getting bolder. 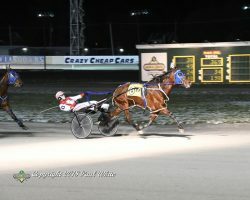 Sportsmuffler continued to dominate the local distaff colony by winning the $10,400 fillies and mares Open handicap pace with little effort on a cold night at Batavia Downs on Monday (Dec. 5). Driver Billy Davis Jr. left three-wide with the 1-5 Sportsmuffler and out-dueled Kaitlyn Rae (Mike Caprio) to the catbird seat, from where she dictated the rest of the race. With no challengers for three-quarters of the mile, Sportsmuffler got to that station in 1:26.4 when Caprio pulled the pocket-sitting Kaitlyn Rae to take their best shot. But try as they might, their best was no match for the streaking Sportsmuffler who after a tap and a swish from Davis, paced away to a 2 3/4 length-victory in 1:55.4. Sportsmuffler takes the Filly and Mare Open Pace at Batavia Downs. Paul White photo. Sportsmuffler ($2.40) has now won five out of the last eight top class mare races in as many starts at Batavia. She has also matched her 2017 career-best total of wins, scoring her 11th this year and has reached a new single-season high for earnings of $74,506 for owner Rose Campbell. Steve Kiblin is the trainer of the Sportsmaster progeny. Davis had a stellar night in the bike, besides winning the feature. He also won two other races on the card of eight giving him a hat trick for the evening. Davis has been on a roll the past couple of weeks and as such, is now in the conversation for leading dash driver of the meet. With Wednesday’s (Dec. 5) three wins Davis now has 97 for the season, only 10 behind the leading Drew Monti (107) and five behind second-place Kevin Cummings (102). With four nights left in the meet, Davis has a legitimate shot of making up the shortfall and taking the 2018 driver race to a photo finish. Racing resumes at Batavia Downs on Friday (Dec. 7) with post time set for 6 p.m.